Ooops! 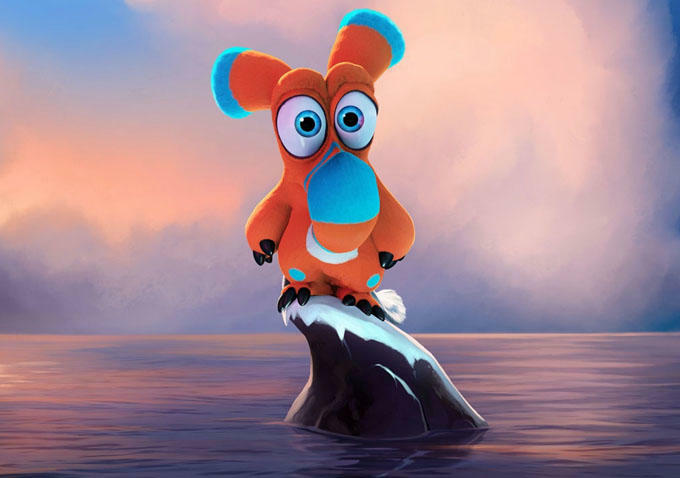 Noah is Gone… Animated movie announcement by Fred Patten. Ooops! Noah is Gone…, directed by Toby Genkel and Sean McCormack. For Summer 2015. The number of theatrical animated features coming in 2015 keeps getting larger. There have been uncountable magazine cartoon variations of a pair of unicorns standing on a rainswept mountaintop, watching Noah’s Ark sailing off into the distance. But up to now, no animated feature has concentrated upon the animals that didn’t get onto the Ark. Well, mainly just a couple of the animals; the nestrians and the grymps. No, I haven’t heard of them before, either. The German film sales company Global Screen has announced that Ulysses Filmproduktion in Hamburg is just finishing production of Ooops! Noah is Gone… (Ooops! Die Arche ist Weg …), a CGI “end of the world comedy” for families/children about the “untold story of the animals that didn’t get on the ark”. Since getting onto the Ark is vital to their survival, Dave screws up his courage and disguises them as … well, presumably something that’s on the approved list. More importantly, they make friends with the two grymps, the feisty Hazel and her daughter Leah. The grymps resemble foxes with raccoon markings. Something goes wrong, and the two preadolescents get separated from their parents, lost in the scaffolding for the Ark rather than the Ark itself, and fall to the ground. The lion seizes the opportunity to try to get rid of both nestrians, but Hazel is determined to rescue her daughter. Dave and Hazel fight the other animals to turn the Ark around and go back for their children, while Finney and Leah scramble to reach higher and higher ground ahead of the rising waters, while fighting griffins and other animals who did not make it aboard the Ark. Since neither the nestrians nor the grymps are around today, the implication is that Dave, Hazel, and their kids do not succeed. But Ooops! Noah is Gone… is a family/children’s film, which implies a happy ending somehow. The trailer promises smooth and colorful 3-D/CGI animation, although the animals’ fur looks more like fuzzy cloth, and the lion has a chin that outdoes Jay Leno’s. Does a family/children’s feature need a happy ending? When Roald Dahl died on November 23, 1990, he was thunderously denouncing (and maybe threatening to sue; I forget) Jim Henson Productions and Warner Bros. for changing the ending of his children’s novel “The Witches”, which they had just turned into a live-action feature, despite his refusal to allow it. The novel is about Luke, an 8-year-old boy who is turned into a mouse by evil witches but continues to fight them. At the end, Luke has won but he’s still a mouse, and since the life-span of a mouse is only about two years, he can expect to die in about a year. The movie changed this to have a friendly witch change Luke back into a boy to resume living his human life. Dahl and Henson & Warner Bros. were still arguing over “you can’t have an unhappy ending for families and children / then why is my book so popular?” when Dahl died. Here is the film’s British trailer under the title “Two By Two”. This is considerably different, and shows more of the movie.